Regional models are most suitable to evaluate the likelihood of changes in extreme events, and while they have been widely applied in Europe and North America, other areas such as Africa, Latin America and some parts of Asia mainly depend on GCM projections, and detailed regional analyses are still limited in number (Solman et al., 2008; Nunez et al., 2009). However, climate change will certainly influence the frequency and intensity of drought and waterlogging (Timmermann et al., 1999; IPCC, 2001, 2007; Ekstrom et al., 2005; Fowler et al., 2005; Blenkinsop and Fowler, 2007). Regional models also suggest that rainfall intensity is to increase over southern Africa (Tadross et al., 2005; IPCC, 2007). Compensation between intensity and frequency of rain is expected when the total annual rainfall tends to be maintained over time (i.e. more intense rainfall events spread throughout the year). In almost all global land areas, warm seasons will probably be extremely warm by the end of the 21st century, with very high confidence under the A1B scenario (IPCC, 2007), with increases in the wet season rainfall intensity as well, due mainly to increased cloud loadings and surface evaporation (IPCC, 2007). 2008), while others indicate a likely drop in hurricane frequency (Knutson et al., 2008). 2009). Recent changes in frequencies and intensities of ENSO, especially regarding a perceptible increase in El Niños, suggest that anthropogenic activities could have influenced these changes. This has been addressed via several GCMs, but the inability of the models to fully simulate ENSO has been debated (Timmermann et al., 1999). 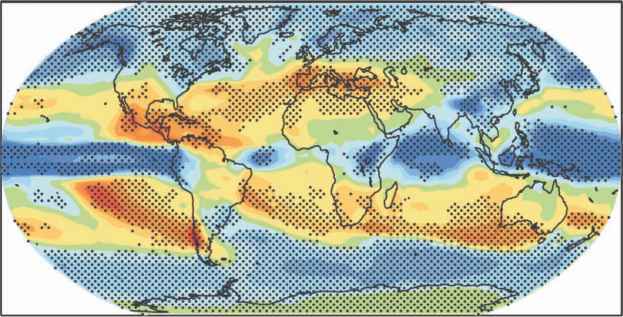 Whether the frequency and/or intensity of El Niños will increase with human-led climate change is still not known.